I promised you pumpkin last week and here it is. 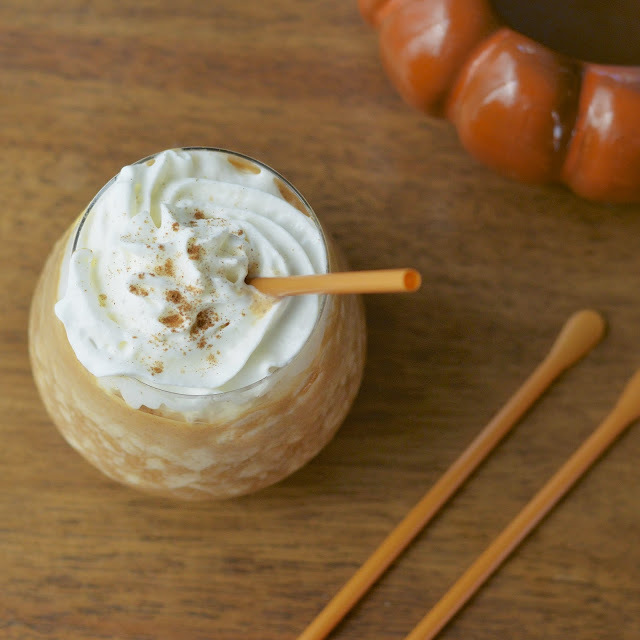 These pumpkin spice frappucinos are the perfect treat for fall. Now that it’s October, I am completely prepared and ready to cook, bake and mix pumpkin! I asked my daughter yesterday what kind of dish I should prepare with pumpkin for FN Dish (Foodnetwork) Let’s Pull Up a Chair segment. I was bored with the usual muffin and quick bread recipes and felt I needed some inspiration. She immediately asked me to simulate Starbuck’s pumpkin spice frappucinos. 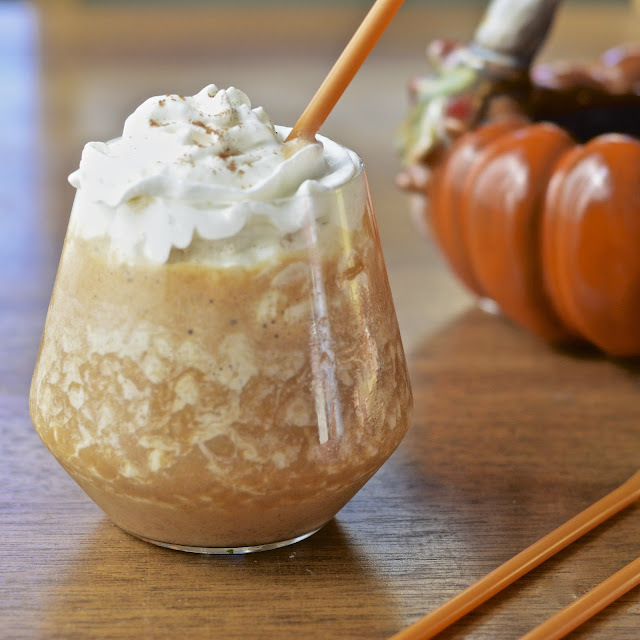 My kids love frappucinos, so it was the perfect copy-cat recipe to experiment with. So I put on my mixologist hat and broke out the blender this afternoon. With just the right amount of milk, coffee, pumpkin, spice, simple syrup, ice and whipped cream, I truly felt like I was drinking a refreshing slice of pie! This is not a low fat version. I believe in moderation, so if you have one of these drinks every so often it’s just fine – just not every day! 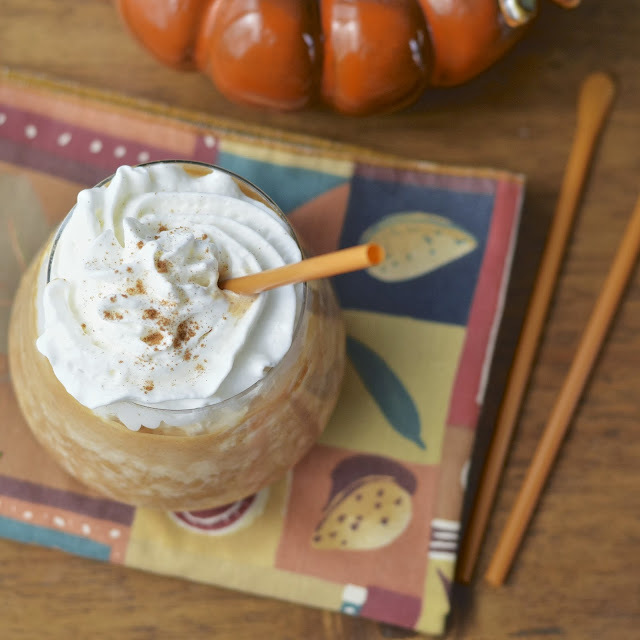 Let a sip of this creamy pumpkin frap ease you into fall with some extra spice, a smidge of caffeine for pep and frosty goodness. You may also enjoy my Cinnamon Toast Crunch Latte recipe. Pour the first 5 ingredients into a blender. Mix on medium until thoroughly combined. *(at this point, if you have time, you can freeze this mixture in an ice cube tray and blend once frozen - this produces a more intensely flavored drink). In a medium saucepan combine 1 cup of sugar and one cup of water. Heat on medium until sugar is dissolved. Let cool and store in refrigerator (you will have lots of extra syrup but comes in handy when preparing other drinks). Fall Fest is a season long franchise where Food Network editors team up with bloggers to share recipes about everyone’s favorite Autumn fruits and vegetables. Be sure to check out the Pinterest Board with over 100,000 followers called Let’s Pull Up A Chair! ...It's to expensive? Lol what? 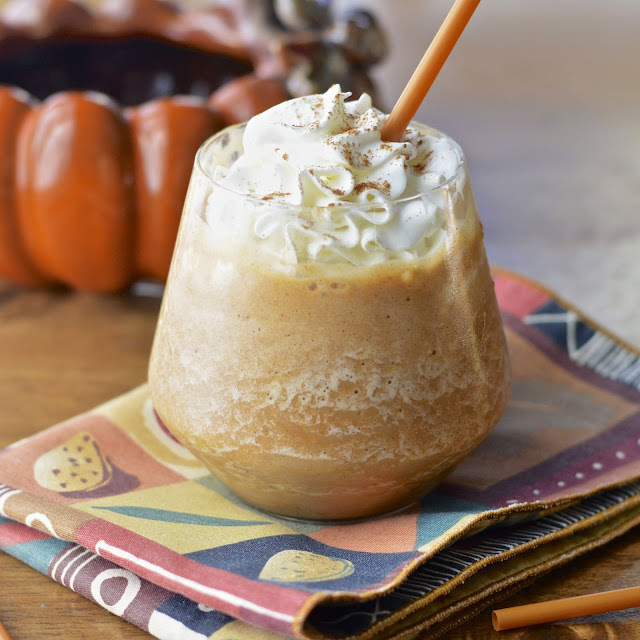 I've never tried the Starbucks version or any pumpkin type drink before, so I'm excited to try this out tomorrow! Can I use cinnamon instead of pumpkin spice? Sorry for late reply Maricela - you can definitely use cinnamon! I don't see why not - definitely give it a try! This may be a ridiculous question, but strong coffee does mean BREWED coffee right? You could just add vanilla Torani (Coffee Syurp) instead of the simple Syurp!